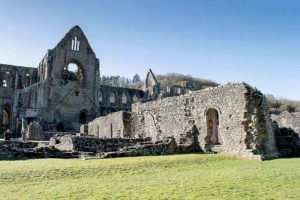 Tintern Abbey dates back to 1131 and lies next to the River Wye in Monmouthshire, South Wales. Over its life time it has been extended to meet the changing requirements of the monks that lived and worshipped there. The tallest remains are that of the Abbey Church, with the rest of the complex well represented by lower walls and foundations giving an idea of the area that this Abbey occupied. If you visit take a few moments to sit on one of the benches dotted around the site. I personally find it a very relaxing and peaceful place ( it does help to be outside of the main tourist season 🙂 ) and with not too much of an imagination you can see why such a location would have been picked. I always wonder how these buildings would have been put up with the technology they would have had available. The skill of the stone masons and other craftsman involved gradually being worn away over time just as much as the building. Access is generally flat lawn and some gravel paths but as with most ancient monuments there are slopes and steps in certain places. As evidenced in my 12 pics series on Tintern Abbey there can be some bright sunlight and harsh shadows cast across the site. There is parking for around 80 cars in total, some by the main entrance and some a short walk away. To say these will fill up quickly in tourist season is a bit of an understatement. The Abbey can be very popular.